The latest experience for IMAX VR visitors puts up to six players inside a Nickelodeon-themed virtual world — SlimeZone is now open to the public at IMAX VR Centres in Los Angeles, New York City and Toronto, and is scheduled to launch at centers in Shanghai, Bangkok and Manchester (UK) soon. After selecting an avatar, users of any age can blast their friends with Nickelodeon’s iconic green slime, play virtual reality versions of games including ping pong and basketball, create art projects using glitter streams and colorful paint, and watch fan-favorite Nickelodeon cartoons. 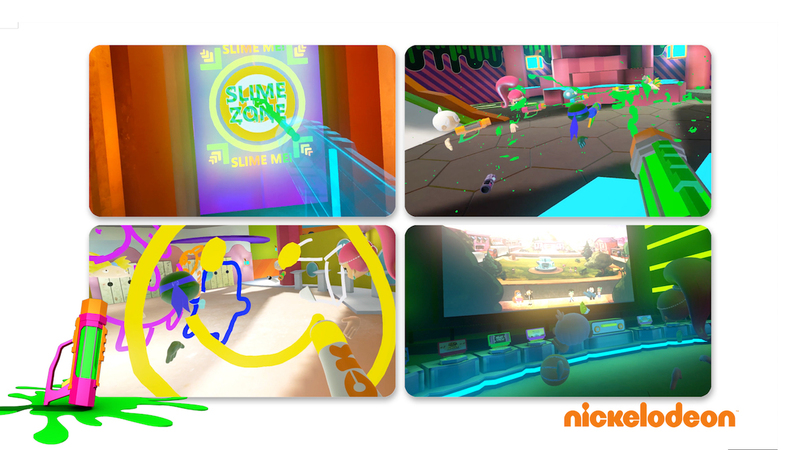 SlimeZone is puts users into a Nickelodeon world at IMAX VR centres. Nickelodeon Entertainment Lab has been experimenting with VR, mixed-reality, augmented reality and artificial intelligence since its launch in 2017. Focusing on long-range research and development of emerging technologies to tell stories, the Lab provides Nickelodeon artists and creators with innovative tools. Nickelodeon recently announced a financial investment in Dreamscape Immersive, the location-based VR startup, and both companies have committed to produce content using some of Nickelodeon’s great properties. 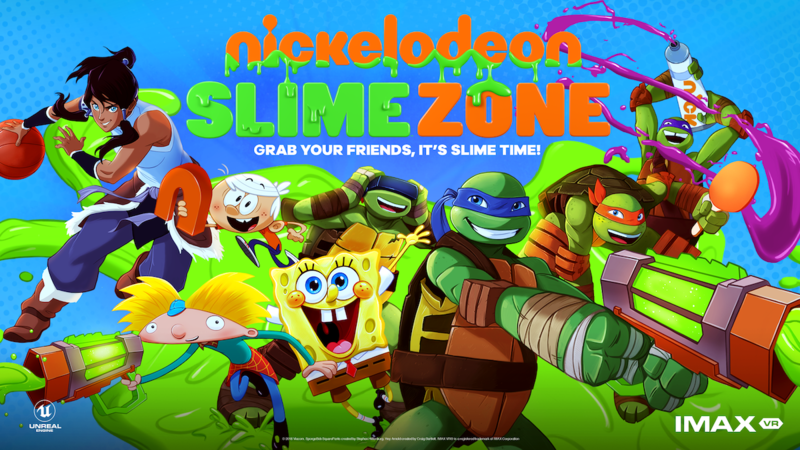 Our SlimeZone partnership with IMAX lets kids and families interact with Nickelodeon properties and characters by bringing them to life in new and innovative ways. This new VR experience will also show the creative community how we are using technology to create unique forms of entertainment for all ages. IMAX VR centres are installed in movie theaters around the country (plus one stand-alone location in California) with a modular design that includes several “pods” to allow users to enjoy interactive virtual reality experiences; some of the pods are networked together so that multiple players can share a single VR encounter. The pods are designed to optimize user mobility and interaction in virtual environments, and can be adapted for specific content experiences by utilize different VR headset technologies that will provide the best experience for the content. IMAX VR guests can participate alongside guests in the virtual reality world in spectator mode or by flying a virtual drone from a device to slime players. I was treated to a visit to an IMAX VR Center in New York City to experience the Nickelodeon SlimeZone for myself. After donning a HTC Vive headset with earphones and a haptic backpack, I selected an avatar (Teenage Mutant Ninja Turtles’ Michelangelo, of course) and received a quick in-world tutorial. Then I was quickly immersed in a world of Spongebob, Invader Zim, Hey Arnold! and more – dousing the other players with my slime cannon, using an anti-gravity glove to shoots hoops with a super-sized basketball and many more activities. When you are ready to experience the SimeZone at an IMAX VR centre, visit www.IMAXVR.com for pricing and availability… I suspect that you will not be disappointed.